THIS TROPICAL OASIS IN PELICAN BAY IS DESIGNED WITH SOPHISTICATED YET RELAXED INTERIORS THAT FLOW EFFORTLESSLY INTO ITS LUSH OUTDOOR SPACES. Nestled in the heart of Pelican Bay in Naples, Fla., is a sophisticated tropical oasis in the upscale waterfront community of Pelican Bay Woods. With remarkable vision, the dream team of Stofft Cooney Architects, Knauf-Koenig Group and Calusa Bay Design created this 7,166-square-foot estate home with a glorious outdoor area that flows effortlessly from the interior spaces. “We wanted to create a sophisticated yet casual lifestyle that brings the outside in, with entertaining as a key factor,” says Leslie Sherman, who is both the home’s developer and part of the design team. The project was seamless from beginning to end. “There were no major challenges, as this was a great site,” architect John Cooney says. “Leslie likes a contemporary twist with a tropical West Indies style, and the home developed well with an open plan that lives inside and out via its expansive floor to ceiling windows.” The result is an open entertaining space that is flooded with natural light. A neutral palette with touches of blue and green tones along with wide-plank flooring, original artwork and hand knotted area rugs add to the home’s coastal chic look. 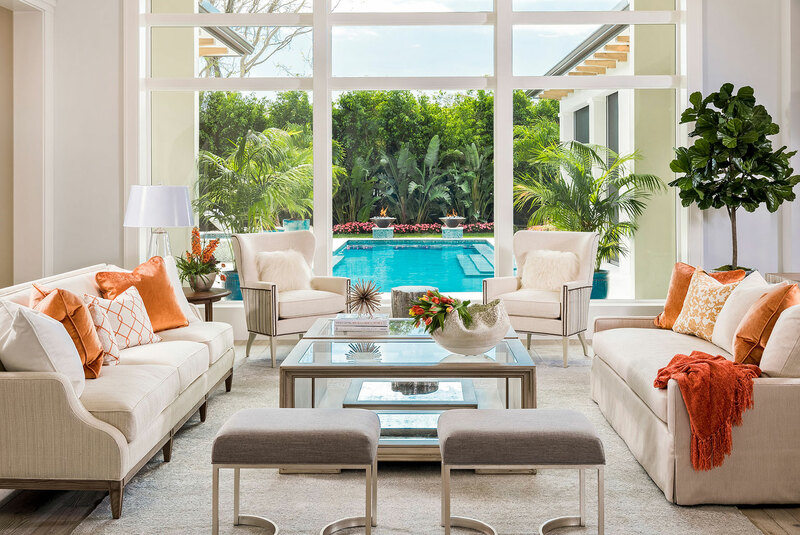 The great room with its large framed view of the landscaped pool area and outdoor living space provides “a beautiful welcoming view from the minute you enter the home … and from there every room gets better,” Design Director Debra Lysy says. “The beauty and quality throughout are what make this home so special.” Two ivory colored sofas from Hickory Chair, one skirted and the other upholstered with tapered legs, are arranged to take full advantage of the view. “The style is sophisticated and eclectic, as evidenced by the combination of antique cocktail tables, contemporary artwork, soft, hand-knotted area rugs and a beautiful, rustic Legno Bastone wide plank oak flooring, all beautifully accented by an occasional pop of tangerine color. COVER PHOTO: The landscape design surrounding the pool is visible from the great room and affords the home complete privacy. A pair of ivory colored armchairs with sides wrapped in striped velvet and gray-linen ottomans with brushed-nickel bases flank antique cocktail tables from Habersham. A light gray, hand-knotted area rug from Loloi grounds the space in comfort. In the elegant dining room, a rich walnut table edged by neutral-toned side chairs and patterned host chairs, rests beneath a green recycled glass Currey & Company chandelier that exudes hushed formality. Illuminated inside, matching china cabinets from Century Furniture are finished in slate gray with door fronts of patinaed metal. Created for style and function, the expansive kitchen is a masterpiece of understated elegance. Graceful white cabinetry by Calusa Bay Design, rising 12 feet to the soffit, creates a built-in custom look. Perfectly paired with a soft, dove-gray stained island and wet bar, all topped with two-inch mitered quartzite counters. A glass tiled backsplash coordinates perfectly with four unique upholstered counter stools. 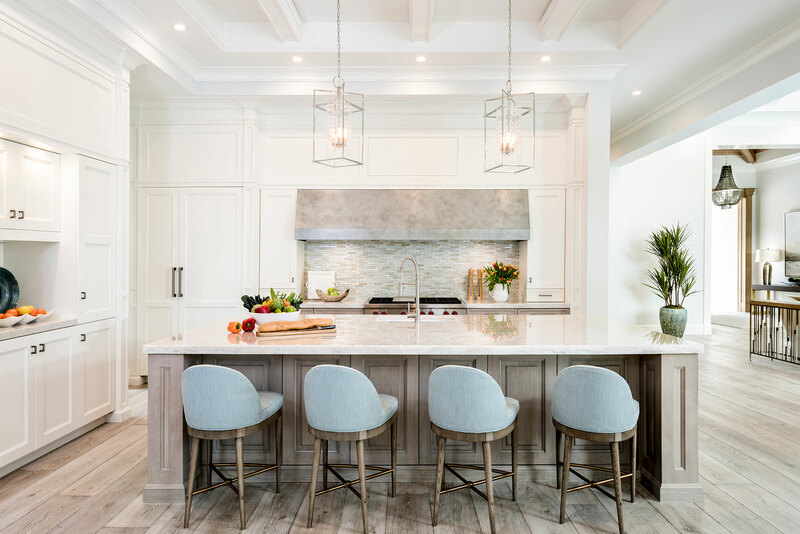 ABOVE: In the sleek, clean-lined kitchen, counter stools from hickory chair clad in a blue sunbrella fabric pull up to the center island, finished in soft dove gray with a stunning two-inch Cristallo quartzite top. Twin sparkling polished nickel pendants from Hudson Valley provide the perfect finishing touch. The family room offers comfortable living with low-key elegance. 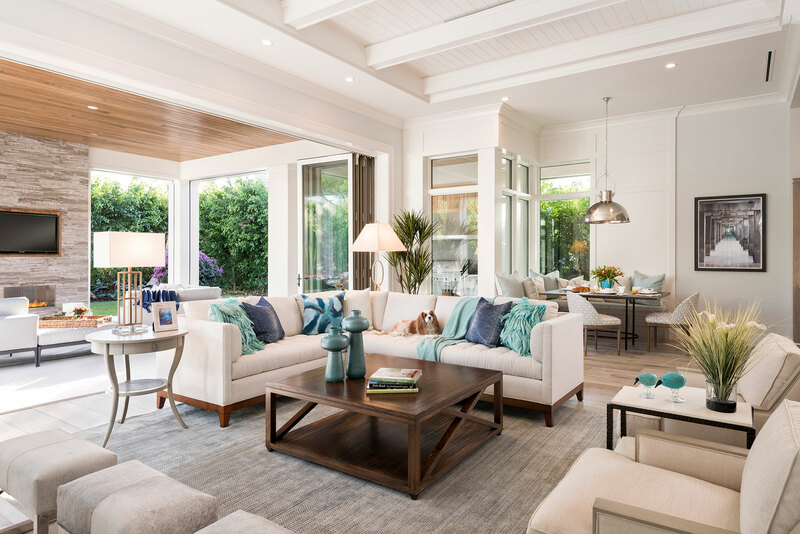 Pearson’s large, stone-colored herringbone-print sectional anchors the space, adorned with vibrant throw pillows in aqua and other coastal blue colors. A cozy breakfast nook with custom bench seating by Calusa Bay Design accommodates casual dining. ABOVE: In the comfortable family room with views of the outdoors, a walnut cocktail table from Vanguard is surrounded by a furniture grouping upholstered in cream linen, triple hair-on-hide ottomans with a polished steel base, and a stone and metal occasional table. The master bedroom wing affords complete privacy coupled with a spa-like serenity. Flanked by park-like gardens on view through large, floor-to-ceiling windows, the king-sized bed features a graceful upholstered headboard with curved wings, dressed in light-toned bedding. Vintage Mid-century modern master chests and a coordinating dresser complete the look. ABOVE: An expansive view from large windows adds a layer of tranquility to the spacious master bedroom designed in neutral tones. Fronting Hickory Chair’s king size bed are Vanguard’s ivory-beige tufted ottomans. 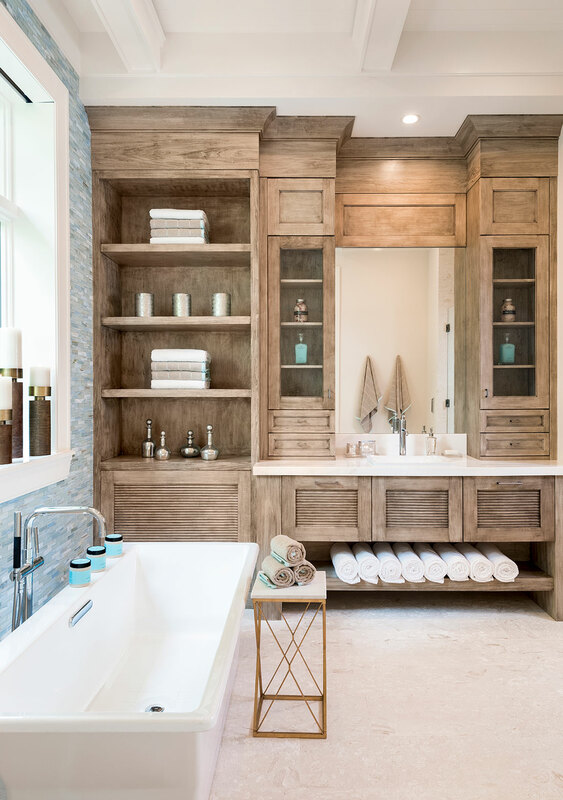 The spa-like master bath is defined by its unique custom cabinetry, finished in driftwood and topped with two-inch white marble, and a freestanding cast iron soaking tub that resembles a work of art. “We created two distinctly separate spaces, perfect for a couple’s daily living,” Sherman says. 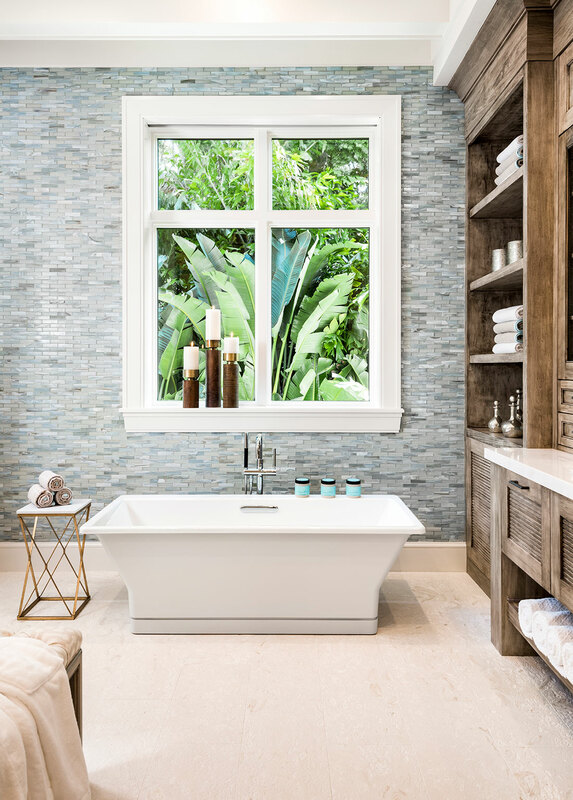 ABOVE: The tranquil, contemporary master bath reflects the homes coastal theme with a glass tile wall in tones of cool pale blue and soft greens. A rectangular vessel sink adds a spa-like vibe. Outdoors, the pool area and loggia are designed for lounging and entertaining. “This house is perfect for a wide range of people … it is great for anyone who loves to entertain and enjoys the lifestyle of indoor-outdoor living Naples has to offer,” Knauf says. A 50-foot-long pool with a raised spa offers hours of fun in the sun. A screened and shuttered loggia featuring a light teak sectional and armchairs cushioned in pale gray, provides a relaxing spot to relax after a swim, or enjoy an al fresco summer dinner. 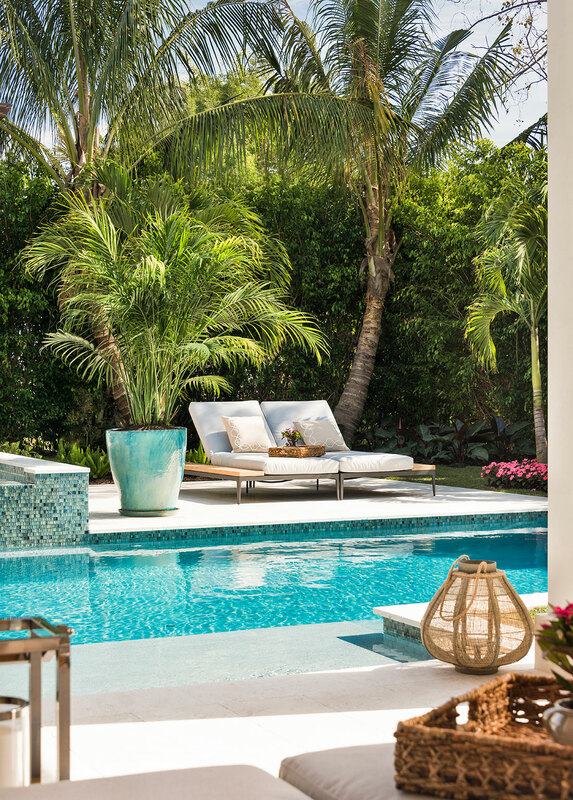 ABOVE: Lounge chairs from Gloster Furniture adorned with accent pillows from Calusa Bay Design surround a sparkling pool lined with mosaic tiles from Ceramic Matrix. 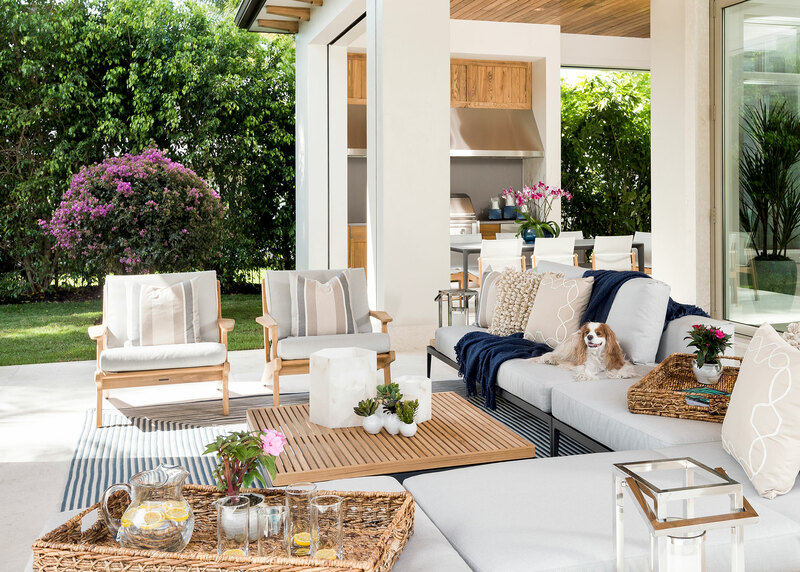 ABOVE: The loggia’s custom fireplace designed by Knauf-Koenig Group, created with porcelain wood-inspired tile, takes center stage along with Maggie, Sherman’s Cavalier King Charles Spaniel, who relaxes on a Gloster sectional.